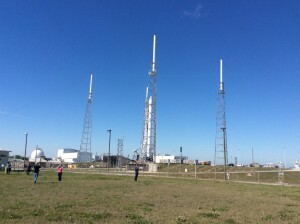 SpaceX’s Falcon 9 rocket sits on its launch pad on Friday awaiting liftoff at Cape Canaveral. Of course, it was SpaceX’s experimental drone ship landing of the first phase — a feat that had been attempted before but succeeded for the first time last Friday — that created just as much excitement and with good reason: it paves the way for developing reusable, lower-cost spaceflight since future missions in deep space will depend upon a sea-based landing. “It’s another step toward the stars,” said SpaceX founder Elon Musk during a post-launch press conference at Kennedy Space Center. For those of you who are not space enthusiasts, take note: NASA and private-sector space innovators are entering into a new and exciting chapter, one that fosters collaboration and hopefully successful outreach beyond low earth orbit to Mars and beyond. Here I am at the countdown clock a little over an hour before launch. 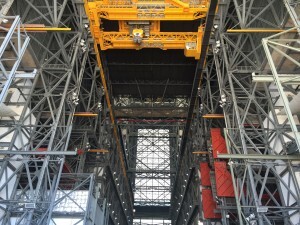 Inside NASA Kennedy Space Center’s Vehicle Assembly Building, which is 520 feet high. 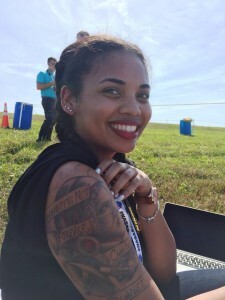 I was one of several bloggers and tweeters invited to take part in a “NASA Social,” a special behind-the-scenes opportunity sponsored by NASA’s social media team to experience the launch, tour key facilities and talk to some of the space agency’s best and brightest. 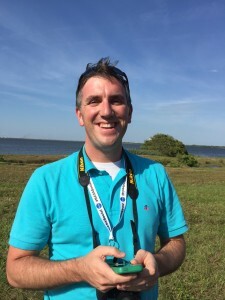 On Friday afternoon we found ourselves on the NASA Causeway a little over two miles from the launch pad as the Dragon rocket roared into a perfect blue sky – and made history minutes later with the historic landing at sea of its first phase. A breathtaking view of Cape Canaveral and the launch pads from the roof of the VAB. Before the launch we had the opportunity to tour Kennedy Space Center’s famed Vehicle Assembly Building, or VAB, where engineers assemble large space vehicles. We headed several stories up to the roof where we enjoyed a breathtaking view of Cape Canaveral and took video and pictures of the launch pad. 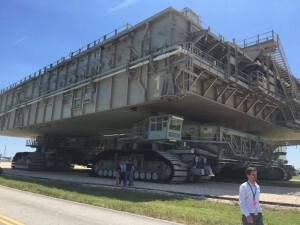 We also got up close and personal with NASA Crawlers, the 50-year-old giant transporters that have carried shuttles and rockets since the Apollo era from the VAB to the launch pads at Launch Complex 39. We learned how they are being upgraded to handle the additional weight requirements of future launches. We also heard from scientists, engineers and astronauts who are shaping NASA’s next chapter and the future of space exploration. We gained a richer appreciation of the agency’s focus on supporting private partners like SpaceX to build the capability to support space exploration beyond low earth orbit. Who can’t wait to see the first launch of Orion in 2018 and follow its mission to take human exploration to Mars? 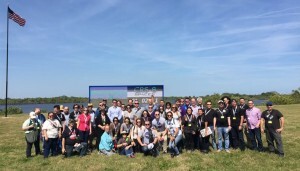 Below is a snapshot of a some of the bloggers, tweeters and YouTubers from across the country who I met and who are helping tell the new story of NASA and SpaceX to an increasingly excited public. 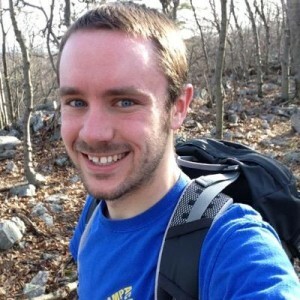 Accuweather sponsored Brian’s attendance at the NASA Social event. Matt plays video games for a living. 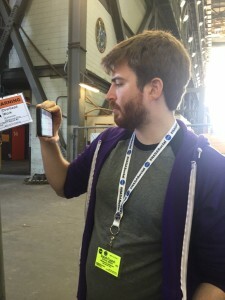 Here, he’s streaming live on his Twitch channel during our briefing at the VAB. “My dad had me into space since I was a kid. This is what I want to do. It’s been great, meeting different NASA workers, getting the inside scoop on what it takes to work here in the future. For the past few months I’ve been thinking about going to school around here. Just being in this area and around this kind of environment makes me want to come even more. 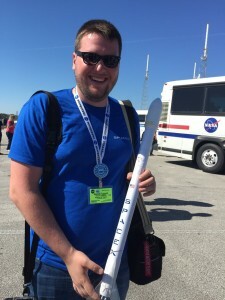 Brandon carrying a model of a Dragon rocket sent to him from a former engineer with SpaceX. 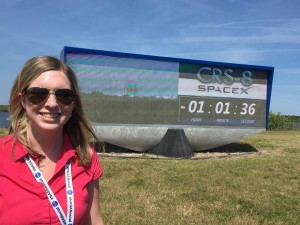 Ashley, a NASA software developer and new hire, is spending eight weeks with groups outside her department. 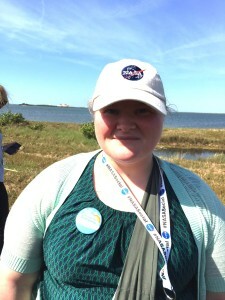 She was lucky to be assigned to the social media team and be part of the NASA Social on April 8th. “What excites me about space is the ability to inspire and the ability to do research that you can’t physically do on the ground, the ability to learn more about our universe – there’s nothing you can’t love about space exploration. I am very excited to be a part of this group, see the launch and go on the Vehicle Assembly building roof. Going on the roof is not something employees can easily do. “The best part about space is it’s our future whether we like it or not, and there are both for-profit companies and governments working together to develop an actual future that we can all live in and keep us safe and not extinct. 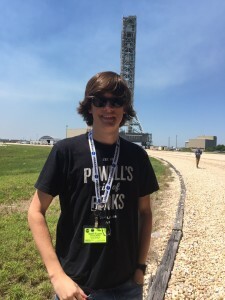 “The best part of being here is that I got to meet a lot of interesting people both from NASA and via social media — I look forward to keeping that conversation going. Just seeing the passion from everybody has been overwhelming…you see it on webcasts, you see it on hashtag chats, but it’s nothing like seeing it in people jumping up and down as a rocket blasts off in front of you. Carter, 18, hopes to study computer science in college. “What excites me about space is Just the idea of people living there every day and the possibility of being to another planet and just being self-sustained and getting to the point where there’s constant missions back and forth. 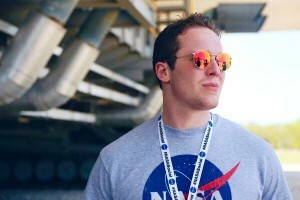 The commercialization of space is really cool — seeing people get more interested in space. Scott with his telescope equipped with a custom software program he developed for closed-loop tracking of moving objects, including satellites and rockets. 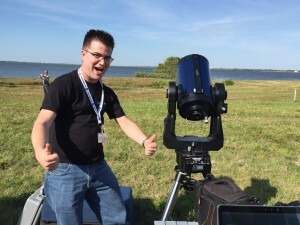 “I grew up in Titusville and saw a ton of launches. I’ve seen some bad launches and some good launches. I was sitting on my front lawn when Challenger exploded. That was a bad day, but today was a great day. It was the best launch I’ve ever gone to. Another highlight was getting to stay on top of the VAB – I’ll probably never get to do that again. That was an incredible experience. That was just an amazing view – words can’t do it justice. Check out my blog Q&A interview with “Orphans of Apollo” filmmaker Michael Potter. Read my Via Satellite article on the ‘SpaceX effect’ in the launch vehicle market. 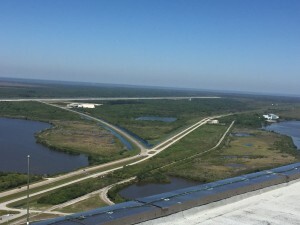 Check back with The Writing Well for more insights from my time at NASA Kennedy Space Center. 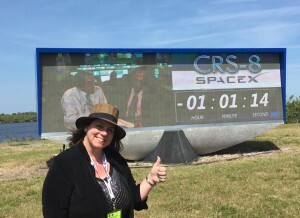 This entry was posted in Blogging, Inspiration, Storytellers, Travel & History and tagged Dragon launch, Kennedy Space Center, NASA, social media, space travel, SpaceX on April 12, 2016 by AnneWainscott. 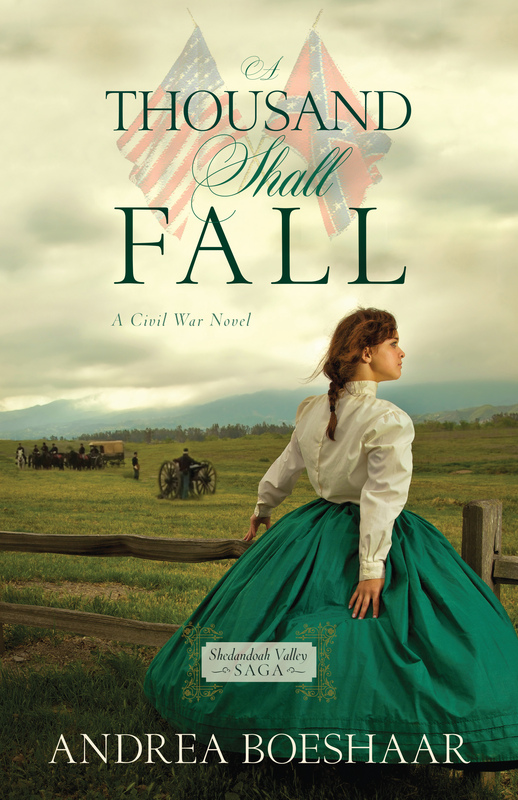 I recently asked prolific historical fiction author Pam Jenoff how she does it all. 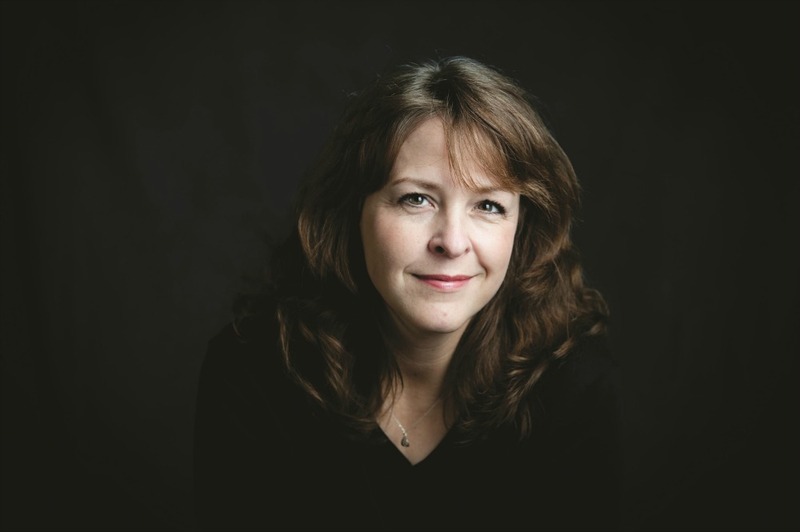 The Cambridge-trained historian, law professor and mother of three has written eight books beginning with her breakout novel, The Kommandant’s Girl, in 2007. Many of Jenoff’s novels are set in Poland during or after WWII. Jenoff, an expert on Poland and the Holocaust, is the former vice-consul for the U.S. State Department in Krakow. 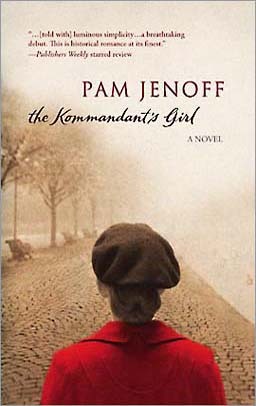 I discovered Jenoff reading an Amazon review of the The Kommandant’s Girl, a story of a 19-year-old Jewish newlywed who is separated by her husband, a leader of Poland’s resistance, when Nazi tanks thunder into her native Poland. She eventually is smuggled out of the Jewish ghetto, assuming a new identity as a gentile. 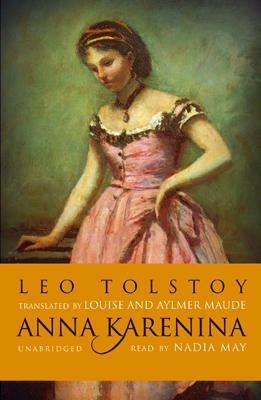 She then faces risks to her safety and heart when she becomes the reluctant assistant to Krakow’s enigmatic kommandant. 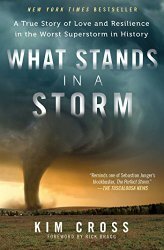 Jenoff’s writing, pacing and all-too-real characters were so compelling I couldn’t put the book down from the opening paragraph to the tension-filled conclusion. 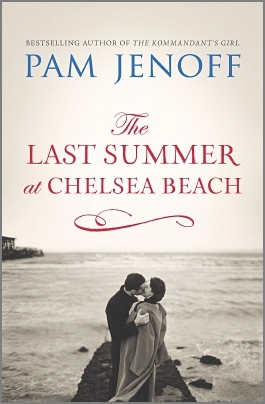 Below, Jenoff shares more about her journey as a storyteller and her next novel set to come out this July. Q. What kind of stories are you drawn to? Did you always want to write? I always wanted to be a writer but all through my many years in school and living abroad, when I had plenty of time to write, I never really got started. The turning point for me was 9/11: I became an attorney and began to practice on September 4, 2001- exactly one week before 9/11. 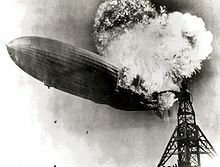 That tragic day served as an epiphany for me that I did not have forever; if I had been one of the 9/11 victims I never would have realized my dream of being a novelist. So I took a course at Temple University night school called “Write Your Novel This Year.” And that’s just what I did. 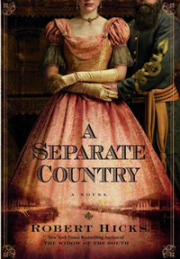 I’ve been drawn to many kinds of books, but historical fiction has always had a strong hold on me. But as a child I just loved great storytelling in general, everything from Lord of the Rings to Mary Poppins. Q. Your work with the US State Department in Poland was the impetus for your first book, The Kommandant’s Girl. What was it about the Polish community you met in your travels that made you want to capture their spirit in a novel? 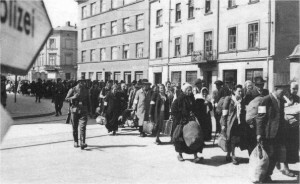 Jews being marched out of the Krakow ghetto in March 1943. I was sent to Poland by the State Department as a junior diplomat and spent 2 ½ years in Krakow. It was a unique moment in time when Poland was dealing with many issues from the war that had never been resolved during the communist era. I found myself involved in issues such as preservation of the concentration camps, anti-Semitism and restitution of property. I also became very close to the community of survivors who became like grandparents to me. My time there was both rewarding and challenging, both personally and professionally and I came out of those years moved and changed by what I had experienced. I knew I wanted to write a novel reflecting that. Q. You really brought to life the internal demons, fear and heroism of your characters, especially Emma Bau, the young Jewish wife caught up in the Nazi atrocities in war-time Poland. Did real people inspire some of your characters — especially Emma, her husband, her husband’s aunt and the Kommandant? All of my characters are fictitious. But while I was writing The Kommandant’s Girl, I learned the true story of the Krakow Jewish resistance – a story I had never learned in all of my years of living in Poland because everyone who was a part of it died during the war. That story became the inspiration for The Kommandant’s Girl. Q. What do you consider the strongest element of your brand of storytelling? 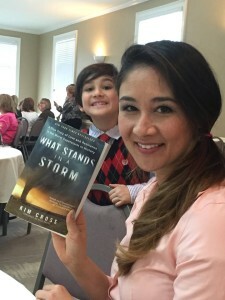 What do you want your readers to get from your writing? I like to explore the way that ordinary lives are changed by extraordinary circumstances – say a young girl who but for the war would have lived a traditional life but now finds herself tested and put in remarkable situations. I also like to explore the gray areas in people and test reader’s preconceived notions. So, for example, my Nazis are real people, my Jewish characters are flawed and my Poles are everywhere in between. This comes from my time in Poland when I found so many of my notions of what had happened during the war tested and redrawn. Q. You have gone on to write several other novels. What lessons have you learned along the way that you wish you’d known when you first started? Oh goodness, I am still just figuring it all out. But I’ve learned a few really valuable things: first, that there is this amazing community of writers out there and if you reach out and support others you receive that support back a hundred-fold. It makes the whole thing so much less lonely. Second, the greatest thing about the internet age is the ability for readers and writers to connect and develop sustained on-going relationships. Not just me sending out an e-mail once a year saying “Hey buy my new book” but for us to have meaningful conversation. There is nothing more sustaining when I wake up in the predawn hours to write than a message from a reader saying hello. I love hearing from readers and skyping with book clubs. Please find me on Facebook, Twitter or wherever you hang out. Q. I know you have a new book coming out in July 2015. Can you tell us about it and whether it is a departure from your earlier books? THE LAST SUMMER AT CHELSEA BEACH will be out in late July. 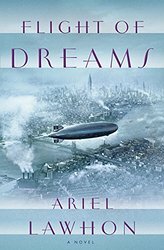 It is the story of Adelia Montforte, a young Italian Jewish immigrant who comes to America alone and falls in with the neighboring four Irish Catholic Connally boys at the shore right as American enters the war and everything changes. 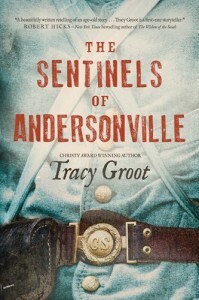 I am so very excited about this book, which is a huge departure for me in that it is set on the home front while keeping with the WWII era that is so beloved to me and my readers. Q. Any final words of advice to those who are still working on that first novel? Don’t quit your day job! Kidding, though the road to publication is long and it helps to have income and a support network. But I think three things have made the difference for me in publishing. First, discipline, the ability to make that writing time for myself (because no one else will do it for me.) Second, tenacity. For a long time it did not look as though my first book was going to be published and the ability to keep knocking on that door until it opened was huge. Finally, I think the ability to revise – to take someone else’s feedback and make it your own – is key. 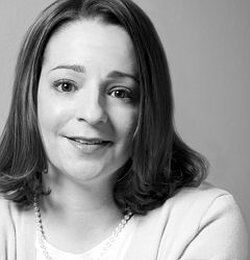 (Jenoff adds that she recently completed the 100 Days of Writing Challenge where she worked on her current book every day.) “Sometimes it was just a half an hour but it felt great to touch the paper or keyboard everyday, so much so that I have just started my second 100 days. Also I don’t believe in writer’s block and I have developed systems to avoid it, like taking notes the night before so that when I’m bleary eyed at five am I have prompts from which I can start writing,” she says. Pam is the author of eight novels. 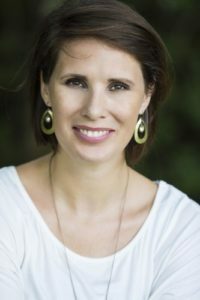 Her first book, The Kommandant’s Girl, was an international bestseller and nominated for a Quill award. 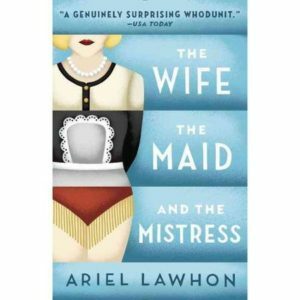 Other novels include The Winter Guest, The Diplomat’s Wife, The Ambassador’s Daughter, Almost Home, A Hidden Affair and The Things We Cherished. The Kindle version of The Kommandant’s Girl is presently on sale for just $1.99 on Amazon. 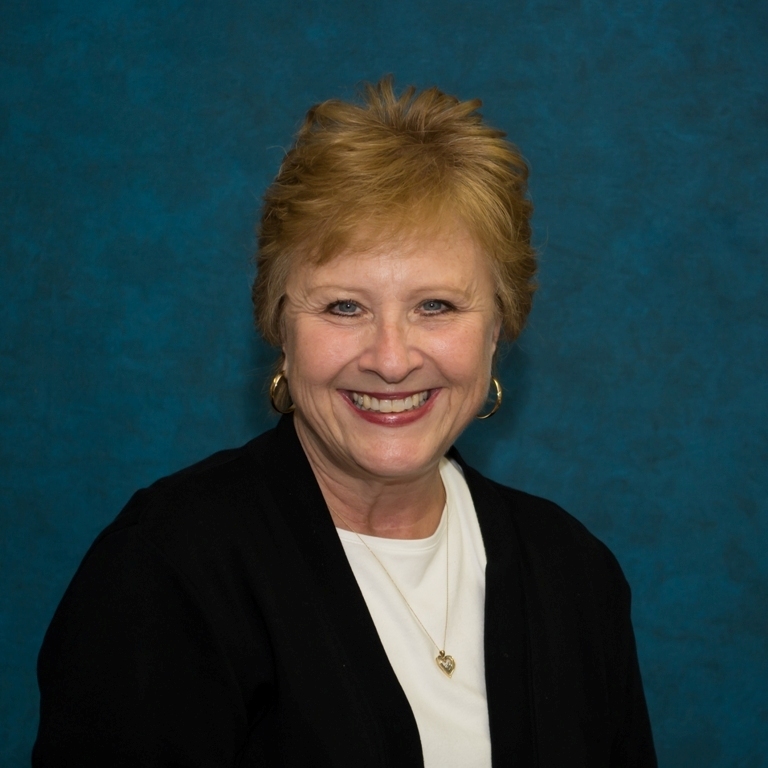 This entry was posted in Author Interviews, Travel & History, Writing Tips and tagged historical fiction, Kommandant's Girl, Pam Jenoff, writing about Holocaust, writing tips on May 5, 2015 by AnneWainscott. 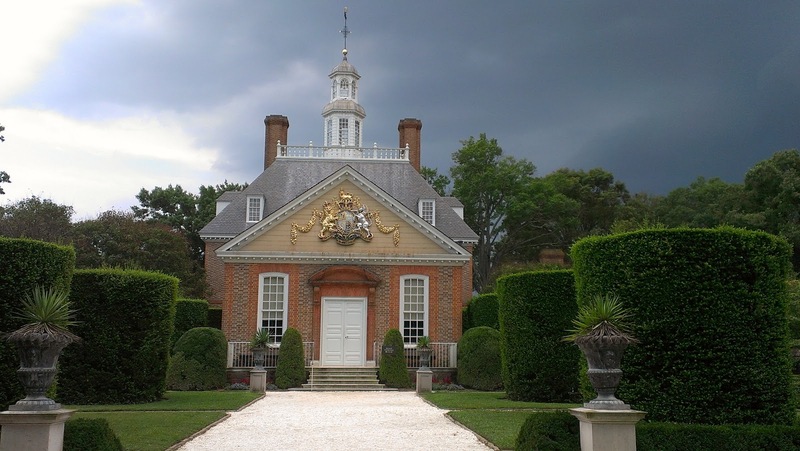 Behind the Governor’s Palace, home of the Virginia colony’s royal and post colonial governors. 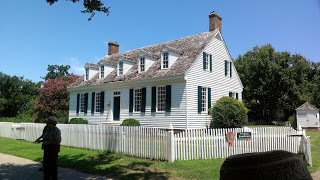 This weekend my family and I returned from a fun-filled week in Colonial Williamsburg and surrounding venues in Yorktown and Jamestown. All three of these places, which form the Historical Triangle, took us back in time to understand our country’s history. 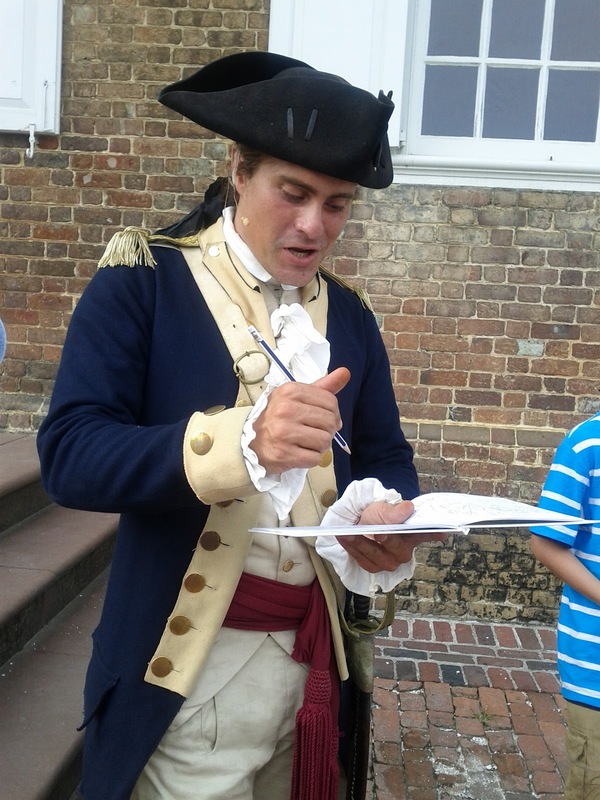 Williamsburg, with its authentic buildings and memorable storytelling, gave us an appreciation for life as a colonialist under British rule and forces that led to our nation’s struggle for independence. A Virginia regimental officer signs my daughter’s book. I wouldn’t hesitate to repeat this adventure; the week of July 26 was ideal timing – we escaped Hotlanta for a noticeably milder climate, and experienced only one afternoon of heavy rain, which we mostly avoided by touring the Governor’s Palace. Williamsburg, the home to the College of William and Mary, is a history buff’s dream destination. 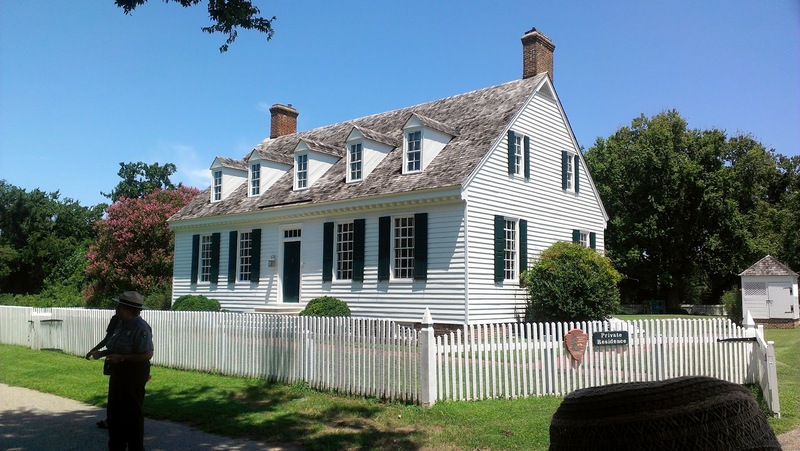 Beautiful museums, refurbished colonial homes, businesses operated by silversmiths and other skilled trades people, a printer and post office, and taverns serving period fare – all allowed us to go back in time and experience America with 18thcentury eyes. 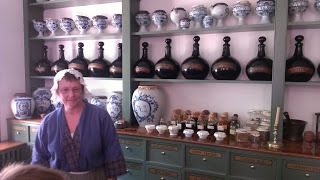 The apothecary served as a pharmacy and doctor office all in one. We learned that much of colonial Williamsburg’s restoration was due to the philanthropy of John D. Rockefeller Jr., who, along with his wife, Abby, restored this town to its colonial roots beginning in 1926. Over the course of the project, some 720 Williamsburg buildings were demolished and rebuilt. Missing Colonial structures were reconstructed on their original sites during the 1930s. 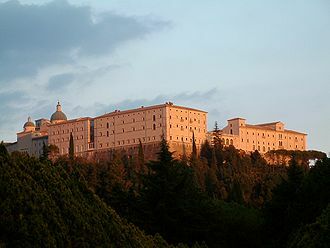 Others were restored to estimates of 18th-century appearance, with traces of later buildings and improvements removed. 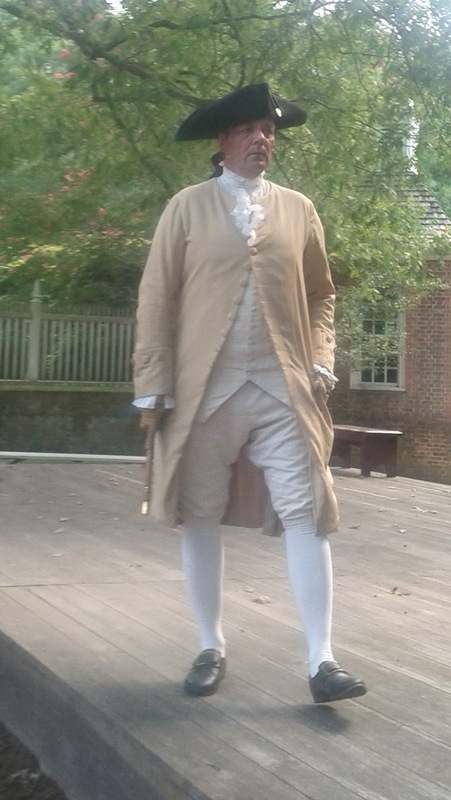 We spoke with authentically dressed reenactors depicting both everyday citizens and key revolutionary figures such as George Washington, Thomas Jefferson and Patrick Henry. In heartfelt debates and chats with “citizens” of Virginia, these figures were fully immersed in the time period, never stepping out of their roles. I chatted with the milliner, wig maker and operator of an apothecary, as well as bantered with a military chaplain and a second lieutenant in the Third Virginia Regiment. 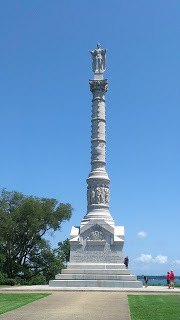 “George Washington” addressed us twice; as a successful planter a year before war broke out when the colonies were not yet in open conflict, and a second time on horseback when he was commander of the Continental Army on the eve of leaving for Yorktown and the definitive battle of the war. A National Park Ranger tour of Yorktown provided us historical context into the strategic value of the city (with its deep waterways), and the allied strength of Colonial and French troops led by George Washington and Comte de Rochambeau. 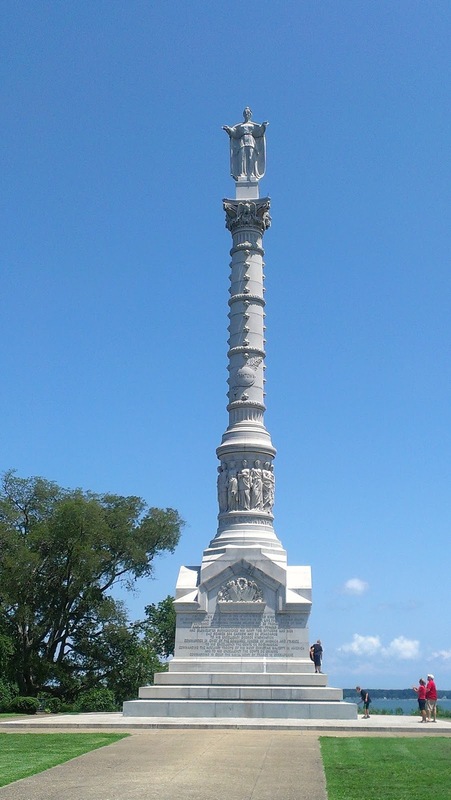 Yorktown proved to be the last major land battle of the American Revolutionary War. 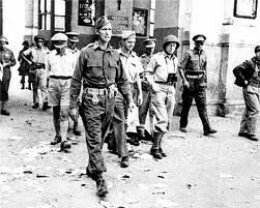 What I didn’t realize until touring the city was how pivotal a surprise move over land coordinated with a French naval blockade was to Colonial and French success against the world’s greatest military power of the time. 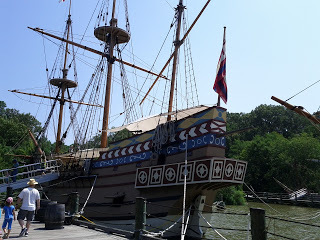 A replica of the Susan Constant bound for Jamestown. 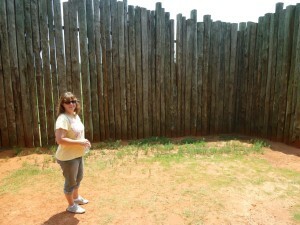 We toured the Indian village and fort carefully recreated near the sight of the original Jamestown Colony. We walked aboard replicas of the three small English ships that arrived in the Chesapeake Bay in 1607. The ships’ 105 passengers and 34 crew members later christened the land “Virginia” in honor of the Virgin Queen, the beloved English matriarch who had passed away in 1603. 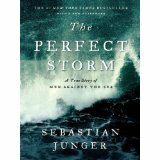 I added to my historical book collection with some compelling revolutionary reads, including Washington’s Spies: The Story of America’s First Spy Ring, and Signing their Lives Away, an account of the 56 signers of the Declaration of Independence, who literally signed their death warrants by openly defying King George III, and the many strange fates that awaited them. My husband and I shared the story of Patriot spy Nathan Hale to our children, as well as the story of the Indian princess Pocahontas. We bought a biography of Benjamin Franklin, a narrative about Thomas Jefferson’s women, and the history of Jamestown Settlement, among others. It was a great trip, and one that I hope to take again. In closing, here are a few memorable quotes from the patriots who debated and dreamed of a future without tyranny, and who willingly sacrificed their livelihoods and their safety to pave the way for American independence. 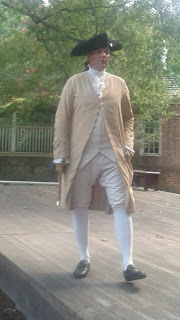 This entry was posted in Travel & History and tagged American history books, Founding Fathers, quotes, Williamsburg on August 7, 2012 by AnneWainscott. 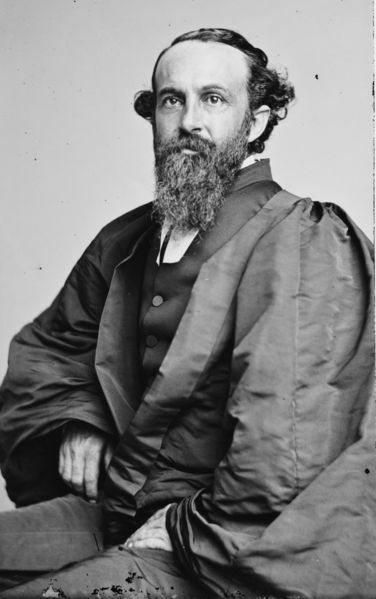 Mathew Brady portrait of Rev. C.T. 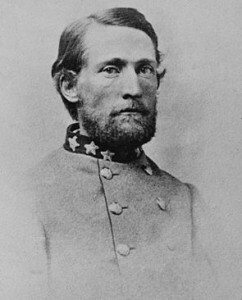 Quintard sometime between 1855 and 1865. The Fourth of July inspires many Americans to look back on their national story. 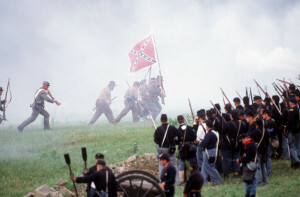 For me, it always brings to mind the most trying moment in our nation’s history: the Civil War. The losses on both sides of the conflict were staggering – costing our country 1.1 million casualties and claiming more than 620,000 lives. 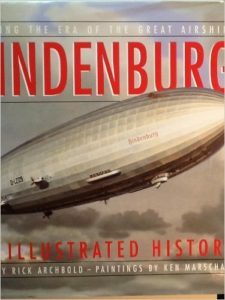 Much has been written about the conflict by eyewitnesses, by presidential biographers and historians, and by crafters of family memoirs. I came across a rare spiritual manuscript from that era thanks to Dr. Bill Nisbet, a retired Army Reserves chaplain who serves as an assistant pastor at my church. Bill Nisbet with the devotional. The Confederate Soldier’s Pocket Manual of Devotions, published in 1863, was compiled by Nisbet’s great-great-great grandfather, Charles Todd Quintard, a medical doctor and chaplain of the First Tennessee Regiment, who later became the Episcopal bishop of Tennessee. Throughout the Civil War, Quintard didn’t hesitate to care for the physical needs of soldiers as a hospital field surgeon. 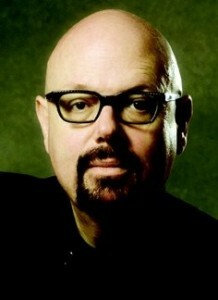 But, according to Nisbet, his primary calling was to nurture souls. As a chaplain, he counseled and comforted privates and generals alike. Mercer University Press reprinted the devotional in 2006 and included a foreword from Nisbet. The first part of the book draws heavily from the Episcopal Book of Common Prayer, including 44 beloved Christian hymns. 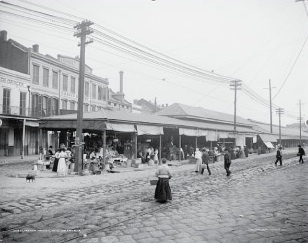 The last part of the manuscript is a reprint of Quintard’s Balm for the Weary and Wounded. The physical wounds were an all-too-common sight from historical photos of Civil War anniversary remembrances, and the vast number of amputees from both the North and South. Nisbet notes that mental trauma of war has gone by many names over the years — in World War I it was shell shock, in World War II it was battle fatigue. In post Vietnam to present day it is called PTSD. 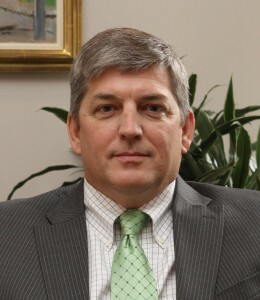 Nisbet has encountered veterans and active servicemen and women throughout his career. A member of his first church included a survivor of a gas attack of World War I. He thinks his great-great-great grandfather’s biggest legacy was as a unifier and priest in the Episcopal Church after the war. He helped heal the divides that tore apart many denominations during the war. Catholic and Episcopal churches were among the few denominations in America that didn’t divide based on their allegiances to North and South. “The Episcopalians were lucky in that way. But they also had guys like Quintard. 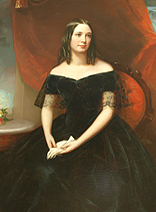 Many Southerners were actually Northerners. 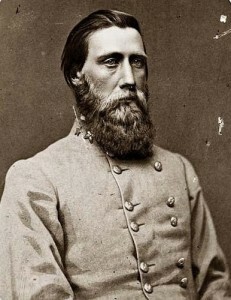 Quintard was in the Confederate Army but was born and raised in Connecticut,” Nisbet says.According to Nisbet, his great-great-great grandfather was never in favor of secession, but when Tennessee left the union and his parishioners asked him to be the unit chaplain, he went with them. 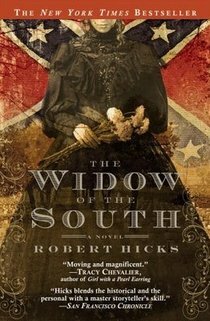 He had by then married a Southerner, adopting the Southern culture. “That’s one of the reasons he wrote the second volume. 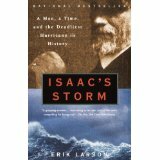 As a doctor, he saw the suffering but he had a spiritual understanding of what it was about,” says Nisbet. After the war, the Diocese met and elected Quintard as the next bishop for Tennessee. 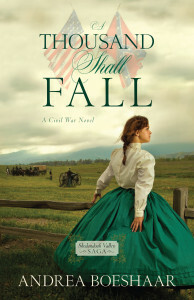 This entry was posted in Author & Literary Trivia, Travel & History and tagged Charles Quintard, Civil War history, devotional for soldiers on July 3, 2012 by AnneWainscott.